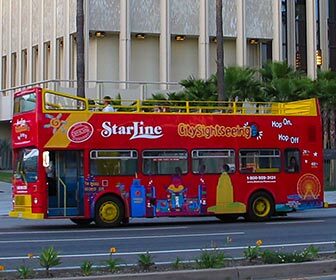 Self-guided Tour: You can use the Hop-on, Hop-off Double-decker Tour Bus network to make your own self-guided tour. Most tours originate from Hollywood and Highland near the Chinese Theatre courtyard, where you can view handprints and footprints of celebrities before your tour. Guided Tours of Los Angeles and Hollywood - A huge list of guided tours in Los Angeles, including tours from Hollywood Boulevard, Walking Tours, Private Tour Guides and more!